The Windsor Spitfires came out firing in the first period and did not slow down as they skated away with a 7-2 victory over the Sudbury Wolves Friday night at the Sudbury Arena. 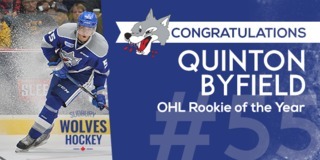 The Wolves managed to beat Spitfires goaltender Michael DiPietro twice with goals from Troy Lajeunesse and Darian Pilon. 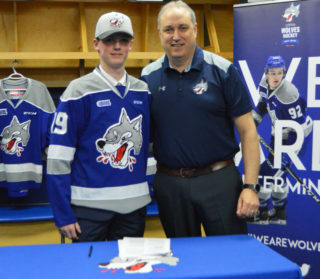 Friday night also marked the first time that Wolves fans were able to catch Michael Pezzetta with a C on his jersey after he was named the team’s 45th captain on Wednesday. Notably, Reagan O’Grady and Kyle Rhodes were both named assistant captains. In the first period, neither team was able to find the back of the net. Marshall Frappier played a strong period in net for the Wolves to settle the play. Despite being out-shot 13-5 in the first period, the Wolves did manage some great chances including a solid chance on a play between Drake Pilon and Kyle Rhodes, a nice rush by Dmitry Sokolov, and a shot from Levin that was sent just over the net. Both teams went into the dressing room tied at zero. A minute and a half into the second period, Lajeunesse broke the goose egg off of a nice play between him, Cole Candella, and Sokolov. Solovov made a great pass to Candella on the point, who quickly hit Lajeunesse with a cross-ice pass that Lajeunesse sent backdoor. 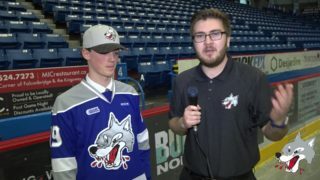 The Wolves held onto the lead for four minutes before the Spitfires unleashed three goals in less than two minutes with goals from Logan Brown, Aaron Luchuk, and Mathew MacDougall. In between the Spitfires second and third goal, Jake McGrath relieved Frappier in net. The Wolves ended the second period down 4-1. Darian Pilon was the lone goal scorer for the Wolves in the third period. His goal came after making a nice move in front of DiPietro that ended with him finding the back of the net. 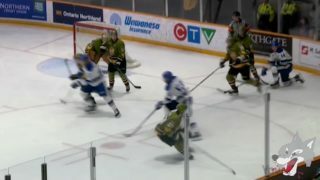 For the Spitfires, Luchuk added two in the third to complete his hat trick. In the final two minutes of the game, Sean Day scored to extend the Spitfires lead to 7-2, which is where it would stay. 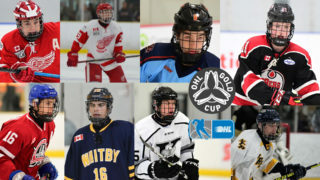 The Spitfires also lead in shots on goal with a 40-26 final. The Wolves will look towards a clean slate as they travel to St. Catharines to take on the Niagara IceDogs Saturday evening at 7:00pm. 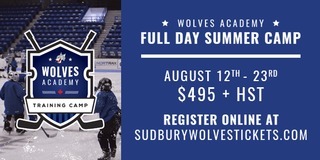 Fans can follow the Wolves on the road in a number of different ways this season, including the live play by play on the radio at 96.7 CKLU or mxlr.com/sudburywolves on the Sudbury Wolves App. In addition to listening to the game, fans can tune into Eastlink TV Channel 10 or 610 to watch the broadcast.